You've picked out the perfect recipe, purchased the best wood pellets, preheated the grill, and slapped the steaks on to cook. Sounds like the perfect meal, right? It could beor it could turn into a night of guessing games and undercooked meat. Take the mystery out of outdoor cooking and add the Wireless Thermometer to your arsenal. A stainless steel probe detects the temperature as you cook, and the remote will alert you when the desired temperature is reached. You can check the temperature from up to 100 feet away with a backlit screen, so you won't be glued to the grill all night. To make things even easier, the Wireless Thermometer offers 6 meat settings, 4 taste settings, and the option to create your own custom setting. Save the guessing games for another time, and get ready to cook to perfection. Remember slap bracelets, from when you were a kid? The Nite Ize SlapLit features that same "slap it to snap it" technology with an added dimension of LED illuminating functionality. Made of durable nylon patterned with a reflective spider web design, the SlapLit is powered by a bright, easy-to-activate LED that lights up the entire wrap. Turn it on, slap it on your wrist, upper arm, or ankle (or any tubular-shaped object, for that matter), and you've got instant night-time visibility. Lightweight and durable, the SlapLit is perfect for after-dark lawn games; running, walking, or cycling at night; and outdoor evening concerts and events. Use and reuse countless times - the SlapLit can be straightened with a simple twist of the thumb and stored flat, or hung in its straightened form and used as an LED marker beacon. Wireless Thermometer You've picked out the perfect recipe, purchased the best wood pellets, preheated the grill, and slapped the steaks on to cook. Sounds like the perfect meal, right? It could beor it could turn into a night of guessing games and undercooked meat. Take the mystery out of outdoor cooking and add the Wireless Thermometer to your arsenal. 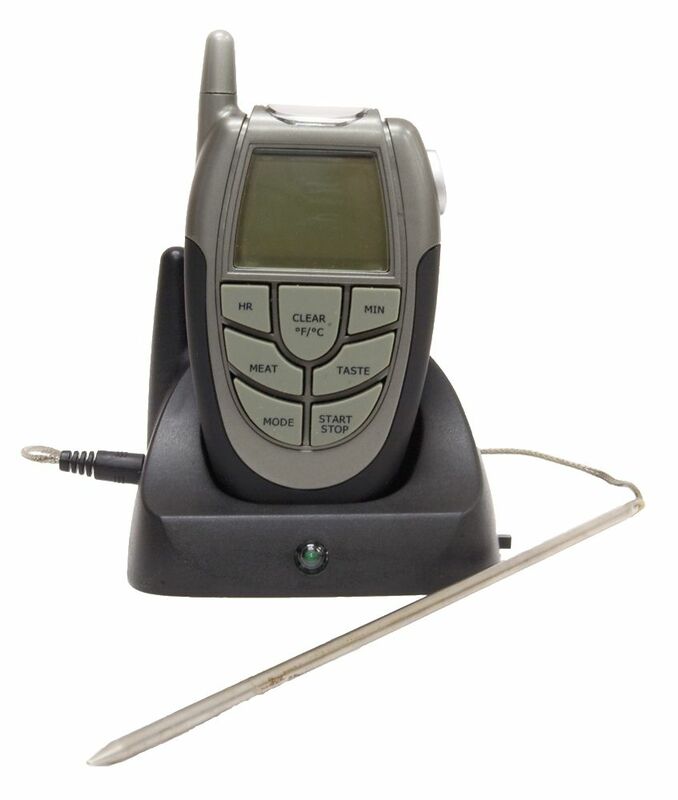 A stainless steel probe detects the temperature as you cook, and the remote will alert you when the desired temperature is reached. You can check the temperature from up to 100 feet away with a backlit screen, so you won't be glued to the grill all night. To make things even easier, the Wireless Thermometer offers 6 meat settings, 4 taste settings, and the option to create your own custom setting. Save the guessing games for another time, and get ready to cook to perfection. Wireless Thermometer is rated 3.3 out of 5 by 7. Rated 1 out of 5 by Upset from Works at about 2 inches I got this as a Christmas gift and have used it twice. It would not register temperature change unless the handheld was placed right next to the transmitter. It also has a different end than the camp chef smoker so you can not hook up the probe directly. Absolutely one of my worst gifts ever. Rated 2 out of 5 by JBUS from Worked ok until it didn’t I changed the batteries today after not using it for about a year and the temp reading while sitting on the counter is 180 F in comparison to an instant probe I have which is reading 65 F, this is a waste of money and now on the big day I need to head to the store to get a new one. Rated 4 out of 5 by Tigerfan from Just as advertised! Great little thermometer. Love not being stuck to the grill! Rated 5 out of 5 by Beetle156 from Great features I bought this for my Wood Wind grill, lazy man I can check the temp while watching TV. Rated 5 out of 5 by Mtn Bikin from Must have for Pellet Smokers. Love this product. Sit in my chair and watch a movie and this tells me when my food is done. Very happy, have recommended it to many of my friends who have smokers. Rated 1 out of 5 by Franklin60 from Look Elsewhere Unit worked great for maybe six months and then I turned it on sitting on the counter and got a reading of 124 degrees. Waste of money for no longer than the unit worked.